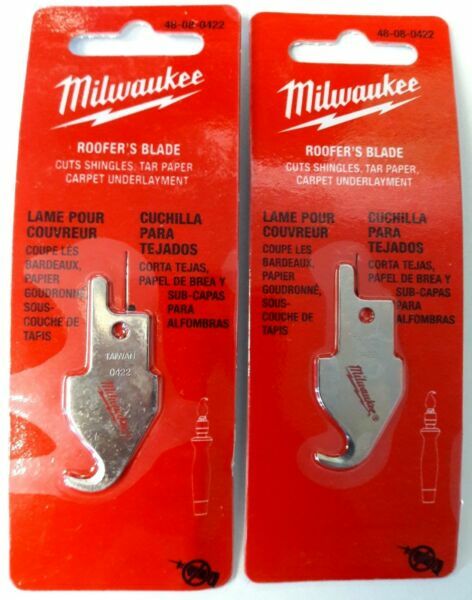 This Roofer's Blade cuts shingles, tar paper and soft vinyl during roofing projects. The hooked end bites into shingles and guides the cut through the target material. A narrow, curved tip hooks over the edge of the shingle to keep the blade in place while cutting. Nickle-plating helps the blade resist rust, while the precision ground edge helps it stay sharp for longer. 1/2" tang fits the Milwaukee® Job-Saw™. If you are on our eBay store, and are interestedin more of our items, we do offer combined shipping! Please understand we cannot see the items inyour shopping cart!! Clickthe buy it now button in each listing forALL of the items you want to purchase. Beforeyou pay, send us an email requestingcombined shipping. Onceyour request is received, we will combine your order and send you acorrected invoice. AFTERyou have received the corrected invoice, you may pay for your order. Forshipping outside of the contiguous US, or international shipping, pleasecontact us. If you have a questionabout one of our products, please email us.We check our email regularly, and try to get questions answered as quickly aspossible.